There’s no denying that the workplace IT environment is more complex than ever before. To make the lives of you and your customers a whole lot easier, Dell offers a full range of devices that are easy to deploy, manage and maintain throughout their entire lifecycle. The lifecycle of these devices provides you with a number of opportunities to improve and secure your customers’ end-user experiences while consolidating their bottom line … and increasing yours. The newest generation of tech-savvy workers have well and truly arrived, with each worker now using an average of 3.5 devices to get their work done. So how do you help your customers keep up – especially when their IT budgets aren’t necessarily rising with the tide? We understand that your biggest priority is maintaining a positive and effective relationship with your customers: encouraging their growth by helping them create and cultivate their personal Digital Transformation. That’s why at Dell, our focus is on handling the detailed enquiries your customers might have via our industry-leading, co-deployable co-delivery service. Not only will you get devices that can come from the factory pre-imaged, with free tools from Dell that make management of devices so much easier, but you’ll experience peace of mind knowing that we have the answers to any and all of your customers’ requirements – no matter what stage of the lifecycle they’re in. Ultimately, your customers need a fresh approach: cost-effective solutions that keep pace with user demand while freeing up time, money and resources to reinvest in future innovation. That’s why we’re redefining the concept of PC lifecycle management. 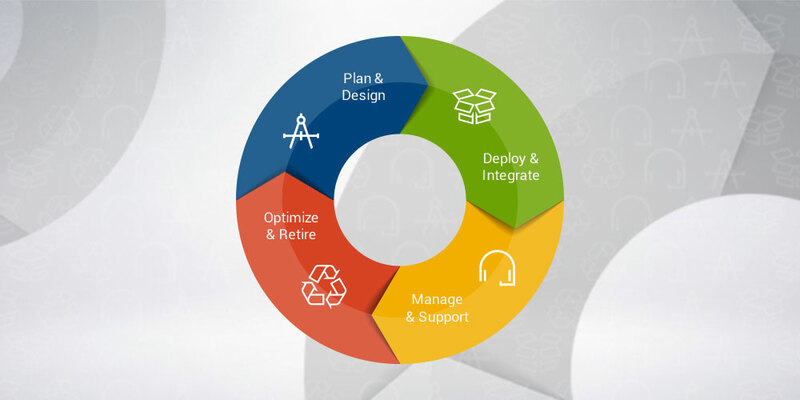 By moving from separated linear solutions to a fully integrated 4-phase cyclical process, we can help optimize your customers’ PC performance at every level. By eliminating redundancies, significantly improving security and streamlining the entire process end-to-end, your customers can save up to 25 percent on PC management as a whole. Dell provides you with experienced specialists to help you get everything right from the very start. Starting with a thorough assessment of your customer’s specific needs, a well-defined plan is created to optimize the existing IT environment, while managing complex transformations to newer technologies. Through this approach, Dell can help you migrate applications, optimize data and operating systems, implement cloud solutions and roll out critical infrastructure. Dell ProDeploy Client Suite: a fixed price, off-the-shelf solution that delivers systems pre-imaged and configured. To ensure that your customers’ end users can exploit all the benefits of this deployment, you can also offer them Dell Education Services, which provides full-service training for both regular users and IT professionals. Once deployment and implementation have been established, you’ll want to maximize efficiency while minimizing downtime. Dell ProSupport provides fast proactive IT support for businesses of all sizes. Your customers get a team of in-region engineers who are available 24×7 and respond proactively to provide them with a single source for hardware and software issues, maximizing their user uptime. In addition to the right support, keeping devices secure is critical for everyone, and services like Dell Endpoint Security Suite Enterprise are specially designed to protect your customer’s most vulnerable processes. The final phase of the lifecycle is where you can help your customers make informed decisions on which devices should be retired and which should be re-purposed or refreshed. Dell has the experience to help you calculate the optimum time to implement new equipment before it becomes a dangerous hindrance on both productivity and security. When devices need to be disposed of, worry-free services are available that include analysis of resell opportunities and secure data wipes – all compliant with the latest protocols and regulations. We want to help you make the most of your customers’ PC lifespan. We’ll work behind the scenes with you to ensure you deliver flawless planning right through to re-purposing of assets. Use the co-brandable PC Lifecycle content to take the message to your customers by downloading it on Campaign Builder here. We also have these assets available on the Digital Marketing Platform, so that you can deploy the email and social content directly to your customers from the tool. If you don’t have access to the Digital Marketing Platform, please register here.